Mary Robinette Kowal is multitalented artist who has crafted puppets, regency gowns, and novels, among other things. She won the John W. Campbell Award for best new writer in 2008, and has won multiple awards for her writing since then. “For Want of a Nail” won the Hugo Award for best short story in 2011, and “The Lady Astronaut of Mars” won the Hugo Award for best novelette in 2014. “The Worshipful Society of Glovers” is her second story in Uncanny Magazine. Uncanny Magazine: Though it’s not clear that “The Worshipful Society of Glovers” takes place in our world, it has a historical fantasy feel to it. As with your other historical fantasies, you examine issues of class and systematic injustice that are quite relevant today—in this case healthcare, wage inequality, and the ways in which work can contrive to keep poor people poor rather than enabling them to rise out of poverty. Is this particular story coming from a specific frustration with our current national and global situation, or did these themes just present themselves without conscious intent? Mary Robinette Kowal: Although I don’t dwell on it much, I did set this during the reign of Henry the Eighth. That’s the backstory and also explains the fascination with gloves, which were huge during that time. The origin of the story was in discovering that there was and still is a Worshipful Company of Glovers. I stumbled upon them when I was doing research for my novel Without a Summer and they were so cool. Established in 1349 and still running. I noodled with a couple of story ideas before hitting on this one. At that point, yes, frustration with healthcare came into play. I was in the middle of unexpected medical bills caused by my insurance company going bankrupt right after I had surgery. It was… unpleasant financially. And also really stressful because we had no idea how much we would be on the hook for. As for the themes that resonate across time, this is one of those cases of history repeating. Actual sumptuary laws on the books? No. But when you have politicians saying that poor people shouldn’t have cell phones? How far of is that from “Laws made for the purpose of restraining luxury or extravagance, particularly against inordinate expenditures in the matter of apparel, food, furniture, etc.” I mean, regardless of intention, it has the effect of keeping people in their inherited social strata. Uncanny Magazine: Like the Glamourist Histories, this story focuses on a creator, exploring the art and craft of magic. As someone who creates across several media, do you feel there’s a particular magic that goes into the act of creation? Mary Robinette Kowal: I am fairly prosaic about the act of creation. I’ve been in the arts, as a career, for my entire adult life and know that I’ve written stories by craft alone. The magic, for me, lies between the work and the reader. I put words on a page and they lie there, inert, until a reader picks up the page and imbues them with life, imagining worlds in their head. Like, Vaughn can embroider all day and Littleberry can weave magic in all he wants, but until someone puts them on, they are just gloves. Uncanny Magazine: This story is quite thorny. Littleberry judges Vaughn’s choices, and in the end, Vaughn judges them, too. We don’t know how Sarah would judge them, though. Nor do we know how the Cinderella story referred to in the background reads to its own heroine. We also don’t really know anything about Mossthicket apart from the bargain she makes with Vaughn, and her role in keeping him from being turned in. Is it in some ways easier for people with more official agency like Vaughn and Littleberry to feel more rigid about upholding laws, even when they are themselves victims of systematic oppression? Mary Robinette Kowal: People have pointed out in other places that sexism only works if there are some women who are complicit. In Iceland, they had a nationwide strike in the seventies for equal pay. They got it. As an individual, if you have been oppressed and then are given a seat at the table—even a low seat at the farthest end—you do everything you can to avoid destabilizing your position. Because if you do, you think you’ll wind up below where you started. Oh—as a side note: In my head, the Cinderella story is Anne Boleyn. I mean, you know, if you don’t look past the wedding, it was a happily ever after. Uncanny Magazine: Come to that, why did you choose to focus on Vaughn in this story rather than on one of the female characters? Mary Robinette Kowal: Mostly because I wanted the main character to be a glovemaker, and that required being a man. Uncanny Magazine: If you could create your own pair of ensorcelled gloves, what would you want them to look like and do? Mary Robinette Kowal: Ooo… They would be for focus so that I could work without being distracted by all of the things. I think they would be a deep forest green with sheaves of maize growing out of blackberry brambles. 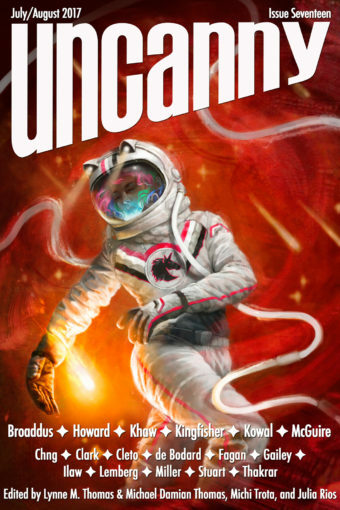 Uncanny Magazine: Finally, I know you’ve got a Lady Astronaut novel series coming up. Can you talk a little about the difference between your approaches to fantasy and science fiction? Are there specific challenges to either one, or specific pleasures? Mary Robinette Kowal: If I didn’t keep doing historical stuff, then fantasy would require less research. Slightly less. On the other hand, I enjoy research, especially when it leads to further story ideas. Other than that, whether I’m creating a magic system, or introducing a new technology, it will change the shape of society as we know it. Both forms require a constant balancing between three questions: Why? How? With what effect? Oh, and for science fiction I get to talk to astronauts. So that’s cool. Uncanny Magazine: Thank you for taking time away from your astronaut chatting schedule to talk with us! Julia Rios is a writer, editor, podcaster, and narrator. Her fiction, nonfiction, and poetry have appeared in Daily Science Fiction, Apex Magazine, and Goblin Fruit. 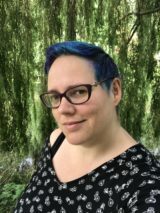 Currently the Fiction Editor for Fireside Magazine, she won the Hugo award in 2017 as Poetry and Reprint editor for Uncanny Magazine, and was a Hugo finalist as a Senior Fiction Editor for Strange Horizons. She is a co-host of The Skiffy and Fanty Show, a general SF discussion podcast, and Walkthrough, a discussion of exercise and geekery with Amal El-Mohtar and Layla Al-Bedawi. She has narrated stories for Podcastle, Pseudopod, and Cast of Wonders.